In this tutorial, I will show you how to transform comments in your WordPress blog from a Linear format into a threaded (or Nested) format without the need of a plugin. There are probably plugins that enhances commenting, but I don´t think you need any, since threaded comments feature in WordPress is not new and is available since version 2.7. Even though, in your WordPress dashboard you can activate threaded comments and indicate the level depth, sometimes you have to make some changes to your WordPress theme for threaded comments to work. This tutorial will take you through the process with a series of steps and checks. What is Threaded Comment Format? 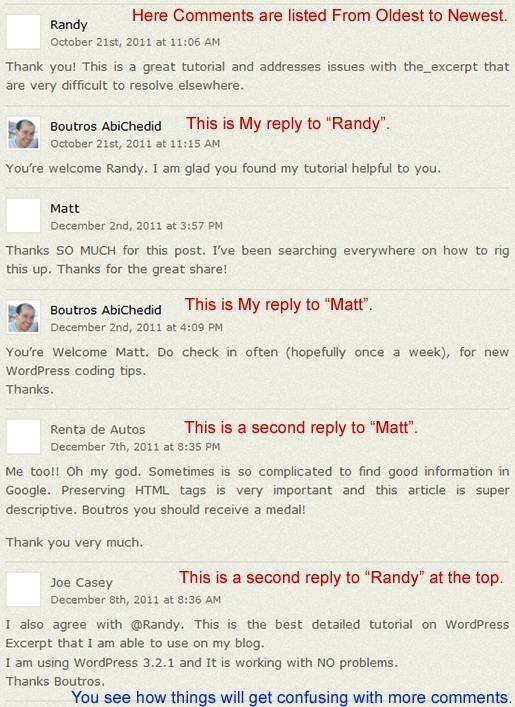 Comment threading is an old WordPress feature that aids the user by visually grouping messages. As a result, there can be a hierarchy of comments displayed in a Threaded or Nested Mode. The alternative is the Linear Commenting Mode, which shows all comments in date order, regardless of who may have replied to whom. Threaded comments are displayed in a tree-like hierarchy where it is possible for users to comment on comments. 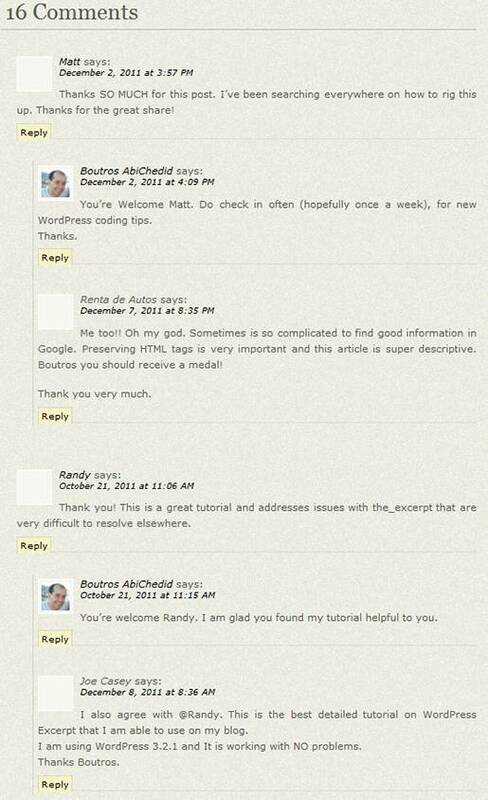 Since version 2.7, WordPress has built-in support for comment threading. However, you will not be able to make use of the Enhanced Comment feature unless your theme supports it. If your theme does not support the Threaded comment format, this tutorial will show how to add the support for threaded comments. Your visitors can interact and respond to other comments easily and with less confusion, which enhances user experience. If you receive a lot of comments, threaded comments can add a lot to the interactivity of the conversation. With Linear commenting the conversation appears broken. With the threaded comments mode, you control the conversation by setting the level allowed in your comment thread, from 1 to 10 in your dashboard. With default WordPress settings, comments are linear. In this case, longer discussions tend to get confusing, as the reader has to keep track of Who is responding to Whom. You can reply to comments directly within the thread, rather than at the bottom of the Comments Section. The image below shows how the Comment section looks like after implementing CODE-2 AND styling it with CODE-2A below. This is what´s known as the Threaded, or Nested, Commenting format. 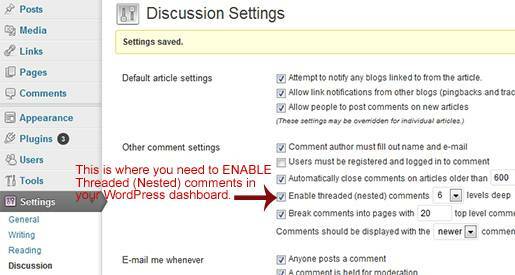 Here are the 7 steps (and checklists) required to check for and create the Threaded or Nested Comments format for your WordPress blog. Note: Threaded Comments are optional and default to OFF, that´s why it is important to start with Step 1 first. Step 1. Login to your WordPress dashboard. In your Administration Screens, and on the Left Panel, go to Settings -> Discussion as shown in the image below. Select Enable threaded (nested) comments …, and choose the level of depth to allow. I suggest setting the depth level to 4, to keep the conversation focused. Step 2. After you selected the “Enable threaded (nested) comments…” checkbox: Are your Blog comments displaying in a Threaded or Nested format? To know that, navigate to a post with comments, you will see a ´Reply´ link below each comment. If your answer is YES: Then STOP right here. Your theme already natively supports Threaded comments, and all you had to do is to enable the Nested commenting format in the dashboard. However, if you don´t like how your nested comments are styled you might want to check my CSS code (CODE-2A). Step 3. Locate your WordPress theme folder and make a Backup copy of the comments.php and style.css files. The backups are your insurance policy in case you get stuck and you need to revert back. Step 4. Open comments.php with your preferred editor. This file is located in your theme´s folder. Step 5. In your original comments.php file, do you see CODE-1 below or something similar? Step 6. If your answer to Step 5 is NO, meaning that the code in your theme´s comments.php file is very different than CODE-1, then STOP Right Here. However; you can continue reading to get clues on how to change the Linear commenting format into Threaded format. Remember that the function that is responsible for listing the comments is wp_list_comments(). The wp_list_comments() function displays all comments for a post or page based on a variety of parameters including ones set in the administration area (Settings -> Discussion). For instance, if you don´t tick the “Enable threaded (nested) comments…” checkbox then the wp_list_comments() function lists the comments in a linear format. Check out the Enhanced Comment Display reference for more help. Step 6A. If your answer to Step 5 is YES, meaning that the code in your theme´s comments.php file is similar to CODE-1, then it is generally safe to delete ALL code in your original comments.php file and replace it with the following CODE-2 below. Don´t worry, you already created a backup copy of your original comments.php file. Right? // Do not delete these lines. The most important function is wp_list_comments() on Line 25 of the code. CODE-2 is XHTML and HTML5 valid. Modify CODE-2 to fit your blog! There is another way (and probably better and more efficient way), to write CODE-2. I will discuss it in a separate tutorial. Finally we need to style the Comments Section (this is Step 7, if you like). We need to style both the list of comments AND the comment form, with CSS. CODE-2A is what I used for the “Emplode Theme” of this blog. The code should be added to your theme´s CSS file (called style.css). * @Description: CSS code for the Comments Section including the Comment form. * The styling works for both Linear and Threaded (Nested) Comment format. If you decide to use my CSS code above in its entirety, make sure to DELETE the styling that relates to the Comments section (and the Comment form) in your style.css file. In other words, you theme´s CSS file has already styling for the comments section, you need to delete this first. Don´t worry, you already created a backup copy of your original style.css file. Right? Both CODE-2 AND CODE-2A work together (as a team). If you modify anything in CODE-2, make sure that styling is also updated if needed. In this tutorial, I showed you how to activate and create Threaded (Nested) Comments formatting for your WordPress Blog without the need of a plugin that you can style to best fit your needs. I also showed you how to update your theme´s files to add the support for Threaded comments. So if you don´t have threaded comment format in your blog, it is time to do so. It will transform your comments section to a more lively and less confusing discussion, especially if you get a lot of comments. How easy did you find this tutorial to implement? Do you have a hard time integrating the code into your WordPress theme? Do you have something to add or anything else to say? If so, please share your opinion or questions in the comments section. Your opinion matters, unless it is a Spam. If you enjoyed this post, please consider: linking back to it, subscribing by email to future posts, or subscribing to the RSS feed to have new articles delivered to your feed reader, or feel free to donate. Thanks! Thank you so much for this!!! It worked like a charm on an old WordPress theme called Deliciously Blue. I appreciate your effort to write such great instructions. REQUIRED: Could not find comment_form. See: comment_form which i understand is wordpress default comment functionality. 57 queries in 0.666 seconds.